As a card-carrying feminist, I know that I am not supposed to like Bond films, given the spectacle of sexism and colonialism that they present onscreen. But I do like them, and I usually enjoy shelling out for the movie ticket and the popcorn for even the most mediocre of the Bonds. I like the art direction, the stagecraft, and the graphic sensibilities of the film series, which is why Quantum of Solace was such a disappointment. Lacking in gadgets, Bond isn't even a particularly imaginative user of a cell phone, which has become so important as a plot device in many other big budget films. And the film itself is almost unwatchable, with its rapid-fire hyperactive editing style, in which a twenty-four-frame second rarely goes by in viewing time uninterrupted by a cut that contributes to the overall incoherence of character and plot. I'm always interested in how government information-gathering and surveillance is depicted in the popular media and how agencies of the state are depicted as users of computational technologies. 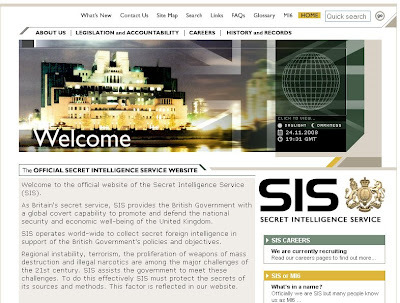 What one would learn from this film about the cultural imaginaries associated with British secret intelligence is that apparently MI-5 has After Effects or some similarly overly designed digital effects program that emphasizes fonts and graphic doo-hickeys rather than the verisimilitude of actually interacting with the contents of a computer screen. As "M" interacts with a Microsoft Surface-style table computer and a variety of wall displays, the viewer is struck by the number of unnecessary dingbat flourishes that are depicted that have little relevance to actual human-computer interaction. 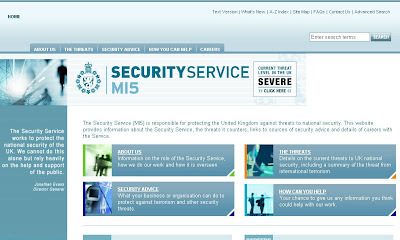 Of course, as these screen shots show, MI-5 and MI-6 both have official government websites. Although both services use information graphics in their web-based appeals to the public, the general aesthetic is clearly subsumed by the functionalism of the day-to-day computer-mediated labor of data mining and information representation that is so critical to their intelligence missions and which seems to functions in the realm of quotidian realism. In many ways, this is an artworking job like any other. But you'll have the satisfaction of knowing that the ultimate purpose of everything you do is to protect the UK. You'll also benefit from very high-quality training in your specialist skills. We're sure you'll understand that as an organisation that collects secret intelligence, we can't tell you a great deal about what you'll be doing. However, we can tell you you'll use the skills you've developed to produce computer generated artwork for print, web and media. You'll also have the chance to rapidly develop your knowledge of pre-press and printing techniques in a fascinating work environment, within our friendly Design and Print team. Articulate, customer-focused and helpful, you'll be the ideal addition - particularly if you've worked in a Mac-based environment using Adobe CS and Quark XPress. I like the fact that even spooks prefer Mac over PC.